Thirty years ago my parents loaded my little brother and me into Dad’s 1978 powder-blue Dodge pickup and headed fifteen miles north to a dairy farm. Once there, we picked out a three-day-old, Holstein bull-calf to take home. Dad carried the little black and white calf out of the barn and climbed in the back of the truck with him. In those days, Dad did not own a livestock trailer so he spent the trip back home in the bed of the truck with “Freddie”, our new calf. Mom drove while my brother and I kneeled on the truck seat, noses pressed to the cold window, watching Dad hold on to the truck bed with one hand and on to Freddie with the other. When we finally arrived home I was thrilled to learn from Dad that the new calf would be my responsibility to care for. As an eight-year-old, I was already a farmer. Over the next fourteen months, Dad and I struck a business arrangement. I would take care of Freddie: feeding him before and after school, making sure his water was always filled, and keeping him bedded with fresh straw. Dad would supply the feed and bedding. There was never any secret as to the end game. Freddie was not a pet, he was food. When Freddie was fattened, or “finished”, Dad and Mom would fill the freezer with a quarter of beef, but the rest would be mine to sell. The profits would be mine to save for college. Fortunately, I had a few aunts and uncles and a kind neighbor who were willing to take a chance with this budding entrepreneur. I was proud as a peacock walking into the local bank to open the savings account with the money I earned. I still maintain the same savings account today. Fast-forward to today. That first calf, Freddie, started our family down a path of providing high-quality, all-natural meats to a long waiting list of people who aren’t just customers, they are passionate fans. Our fans are willing to wait patiently on their meat, pay us a premium for a high-quality product, and best of all, they recommend our high-quality meat products to their family and friends! Whether you are feeding out one steer, a handful of broilers, or 100 pigs, by following a few steps you, too, can leverage your commitment to quality meat production to create a profitable enterprise. Ten years ago our family committed to shifting away from the use of supplemental hormone implants and the use of antibiotics in our livestock. This has been the single most important differentiator and marketing tool for our operation. 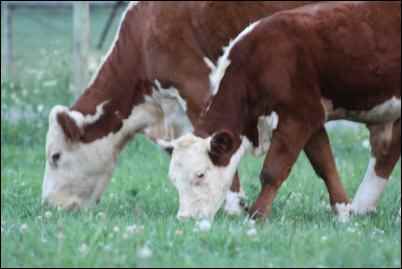 Hormone implants can be an effective way to increase feed consumption and rate of gain. However, we made the strategic decision to move to “all-natural” livestock production where we were willing to sacrifice feed efficiency for a unique product that demands a premium in a crowded market. From a disease control standpoint, eliminating the use of antibiotics has almost been a non-event for us. Years ago, the first sign of a cough in a calf would mean a trip to the veterinary office and a quick shot to remedy the situation. Today, our veterinary expense is nearly zero by leveraging a few simple production practices. In our beef operation, our feeder calves are all sourced from small, local producers whom we know and trust. We avoid buying calves from “cattle jockeys” at all costs. By waiting to purchase weaned beef calves that weigh 400-500 pounds and are free of coughs and runny noses, we significantly decrease the incidents of calf-hood illnesses. These calves come at a higher initial cost than smaller calves, especially three-day-old dairy bull-calves, but with our commitment to producing antibiotic-free meat, the extra cost is often recouped in lower vet bills. 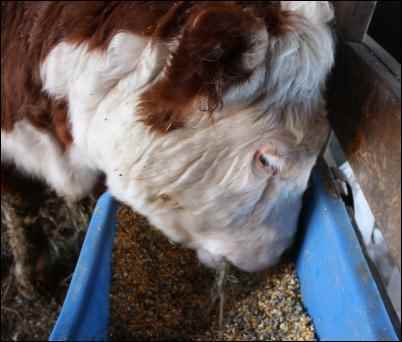 Healthy animals are more efficient and require fewer days on feed. Feeder pigs come from a small Poland-China breeder in our county. He understands our business model and works hard to produce healthy feeder pigs that grow well. The Poland-China breed is known for its hardiness and disease-resistance. The fact that the breed is a “heritage breed” known for its high-quality, tasty meat is incorporated into our discussions with customers. It is imperative our pigs are fed in an environment with lots of natural light that is well-ventilated. All of these factors help decrease disease. The commitment to producing all-natural meats, free of added hormones and antibiotics, has attracted a more sophisticated, higher-net-worth buyer. These buyers often consider their food purchases as an investment into their well-being and health. They are willing to spend more for a high-quality, all-natural product. While purchasing meat in bulk remains a great value, many folks simply cannot afford the cash outlay when they live paycheck to paycheck. By marketing to these higher-than-average earners we know they can afford to buy a quarter of beef or a whole hog at a time. While we will certainly sell our meat to anyone, our lengthy customer list is filled with doctors, nurses, engineers, bankers and other professionals. Additionally, we are fortunate that my brother works for a large, stable food company whose employees appreciate knowing exactly where their food comes from. We have leveraged his contacts there to sell to these folks who are willing to pay a premium for the comfort that comes from knowing and trusting the farmer who is producing your meat. Look around your circle of influence. Who are the people you know who would appreciate and pay more for a high-quality, all-natural product? A critical factor in establishing and maintaining a market for farm-raised meats is partnering with a respected processor as committed to quality as you are. Last year, after taking a single heifer in for processing, the butcher we have utilized for many years called and asked me to stop by his shop. The next day he showed me the rib-eye steaks from the heifer. The layer of fat around the outside was nearly three times as thick when compared to other cattle from our farm! As soon as he saw that extra-thick layer of fat, he questioned if it was, in fact, from our farm. After verifying that it was, he called me immediately. Unwilling to sacrifice quality, I sold that heifer, at a loss, to the processor for ground beef and brought in a different animal the following day to sell to our valued customers. Having a butcher who knows what to expect with animals from our farm, and one who shares expectations for consistency and quality, is imperative in our operation, as it should be in yours. We use this family-owned butcher for beef and hogs. Since they do not have poultry-processing facilities, we utilize another family-owned processor in a neighboring county for our pasture-raised broiler chickens. Regardless of the processor you decide to use, ask them lots of questions about scheduling. Our beef and pork processor is so busy we often have to make the processing appointments the same day we purchase the feeder pigs or calves. Likewise, to ensure timely processing, I normally make poultry appointments the same day I order chicks. Our pastured-broiler operation is the fastest-growing, highest-margin component of our all-natural meat business. In response to requests from customers for chicken that matched the quality of beef and pork we produce, we began raising broilers on a very small scale four years ago. That first group of 25 broilers was a huge success and the demand for our birds exploded. The winter weather in our area only allows for outdoor pasture production of birds in the spring and summer. We normally take orders for birds during February and March. Once we have a handle on production numbers, we then order our chicks from a mail-order hatchery and stagger the delivery of orders, receiving 100 chicks at a time. The chicks start life on our farm inside a small barn under heat lamps. Between 2-3 weeks of age, depending on weather forecasts, they are transferred into our portable chicken tractor in the pasture. Moved daily, the tractor provides access to fresh grass and insects to eat. This pasture diet is supplemented with a ration ground from corn grown on our farm. At eight weeks of age, I load the grown chickens in crates and haul them to the processor. 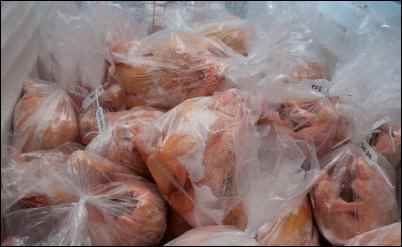 On the way home from the processor, the same day, the fresh birds are delivered, on ice, to eager customers, cut and bagged to individual customer’s specifications. They understand their payment is due on delivery to their homes. The short cycle of pasture-raised broilers has been a great addition as it meets a real cash-flow need in any farm operation during the summer and early months of fall. Another key to the success of our operation is customer communication. I keep a comprehensive spreadsheet detailing which customers received what meat products in which month. Normally, a quarter of beef will last an average family of four six to eight months and half a hog will last six months. Monitoring the spreadsheet lets us know when we should be contacting these customers regarding their next order. 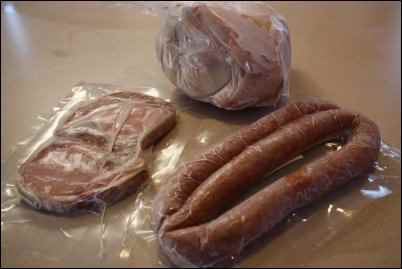 A simple telephone call, e-mail, or text message to confirm their need and they are included in the next meat delivery. I try to give them two-months notice prior to delivery so they can plan within their household budget for the expense. We also print a simple newsletter that is mailed or e-mailed to our customers each January. It contains an update as to farm activities, a few pictures from the farm, any upgrades or changes we have made, as well as an approximate production schedule for the new year, and a reminder to place their broiler chicken orders soon. My wife includes a recipe for some of the trickier-to-cook cuts of meat and most importantly, we always, always, always include an invitation to visit Caffee Vale Farm. Each year we have numerous customers take advantage of the invitation and stop in to see what goes on at the farm. We are as transparent as possible with them, careful to answer each question truthfully. It is also a great incentive to our family to work hard to keep the farm and our livestock and poultry in tip-top shape at all times. Feeding quality, all-natural feeds is the anchor to attracting and retaining raving fans. High-quality, fresh feed ingredients directly translates into high-quality, great-tasting meats. In addition to our freezer-meat business, we are small-scale grain and soybean growers. Following harvest, a predetermined number of bushels—based on customer demand—is stored at the local grain elevator in our farm’s name. As long as we use the same elevator to produce our custom feed-rations throughout the year, they do not charge a storage fee for the grain we store there. Our rations have been developed by our family over the years through trial and error to maximize efficiency while using only all-natural feed components. The elevator will produce our feed rations in relatively small quantities. This is important as it ensures we are always feeding freshly-mixed feed—which is more palatable to the animal—ensuring a higher percentage of nutrient absorption and better consumption of feed, therefore, ultimately raising efficiency. Transforming customers and prospects into passionate fans willing to recommend our products to others takes time, a willingness to be transparent regarding production methods, and effective communication. It has been a rewarding and profitable experience for our family. Committing to the production of a high-quality, unique, meat product comes with a higher cost of production. However, it enables us to earn higher margins for our meats as price-setters, not price-takers in a crowded market. Our formula of selectively partnering with superior livestock suppliers and dedicated processors committed to quality while feeding superior, fresh feeds can ensure your farm operation can deliver quality meat products from your farm gate to the dinner plate of your own raving fans.